Share scripted tasks over a network. Is there a better alternative to KosmicTask? Is KosmicTask really the best app in Applications category? Will KosmicTask work good on macOS 10.13.4? KosmicTask is a secure Integrated Scripting Environment for OS X that enables users to create, edit, execute and share script based tasks using a wide range of scripting languages. Text, background, invisible character and selection colour. KosmicTask needs a review. Be the first to review this app and get the discussion started! KosmicTask needs a rating. Be the first to rate this app and get the discussion started! Each named task contains a script that is executed whenever the task is run and related tasks are commonly arranged into easily identified groups. Tasks can accept a wide range of configurable inputs and can return complex data types and files as task results. KosmicTask utilises a plug-in architecture that permits the creation of tasks in more than twenty different scripting languages. A shared task is one that is made available to all KosmicTask users via their local network. This enables common functionality to be made public. Tasks that are not explicitly shared can be accessed only by users that can authenticate using a valid username and password. KosmicTask supports the simultaneous execution of tasks on multiple machines. Each task executes and displays its results within its own detachable tab. 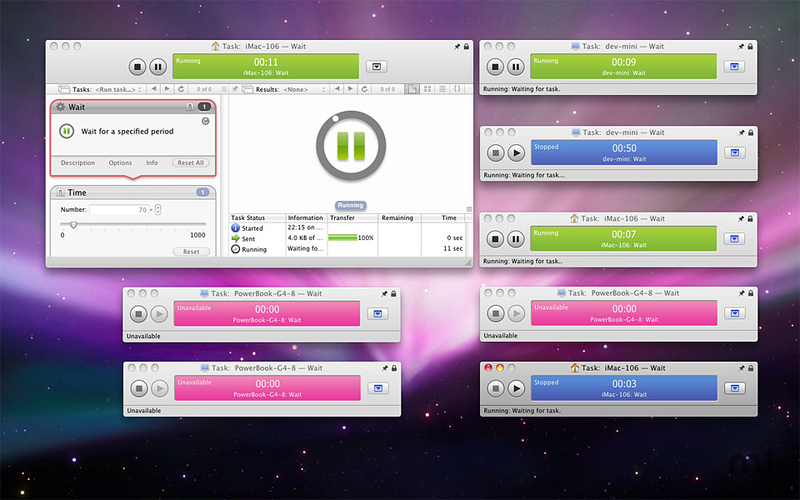 An iTunes like control panel displays the task status and enables tasks to be executed, paused and terminated. Consecutive tasks can be executed within the same tab and KosmicTask retains a full history of all user inputs and results. A separate global history maintains a persistent record of network wide task requests and inputs. Use KosmicTask on a single Mac or home network to carry out repetitive administration and automation tasks. Non technical users can easily utilise existing tasks. More technical users will find that there is a wealth of scripts available on the Internet that they can easily adapt to their purpose. KosmicTask is an effective tool for sharing business automation tasks with end users. Document processing, file processing and automation based services can all be configured from within the application and shared out to clients on the network. KosmicTask provides a great way of introducing students to a wide range of scripting languages. The application comes with a range of both native OS X and embedded scripting languages. Students can develop and test scripts on their own machine whilst educators can review and appraise their tasks via the network. Systems and network administrators will find that the application is a convenient and secure method of providing user scripts and performing script based network maintenance. Developers can use KosmicTask to quickly prototype code ideas. It is also useful for building and organising a library of executable code samples and snippets. The distributed task model means that the application is ideally suited to data acquisition and processing projects. Tasks can be configured to collect and process data on the remote target before returning the results for further analysis and persistence. MID 1021: Fixed AppleScript code colouring. Built AppleScript should now be coloured as it is within the AppleScript Editor. Previously KT AppleScript was coloured according to a set of keywords but the nature of AppleScript terminology makes this approach unreliable. The new implementation means that common commands such as 'so shell script' will be correctly coloured. The colours used to highlight AppleScript are those returned by the AppleScript compiler and therefore do not match those defined in the editor preferences. MID 1489: Updated documentation to note the removal of support for appscript.